Oh, and try for that slower pace. Picture number 2 is a closeup of the design on all four corners of the table topper. Picture number 3 is a closeup of the design in the center of the table topper. (It looks great with Fiesta Ware!). Makes a great table topper and works well on a card table and patio too. Apple Cherry Tablecloth is 52" by 52" and 100% cotton. Machine washable in cold water, tumble dry low, or line dry. Classic TANGO RED and White 1" Check Cotton Tablecloth 60" x 84"
Classic red & white check tablecloth with a 1" square pattern. 100% Cotton, 60" x 84". Machine wash cold. Tumble dry low. New! Kate Spade Garden Rose, Red, White & Blue, Tablecloth 60" x 84"
(I use mine in the kitchen for those dark winter months too!). Let's have a party!". (All of Red and White Kitchen's tablecloths look great with Fiesta Ware!). Makes a great table topper and works well on a card table and patio too. This is a heavy cotton gray and white oblong tablecloth. The photos are taken on a 23" x 27" table. A larger table will produce less overhang. The condition is excellent. TANGO RED and White 1" Check Cotton Tablecloth 52" x 52"
Classic red & white check tablecloth with a 1" square pattern. 100% Cotton, 52" x 52". Machine wash cold. Tumble dry low. The 100% Cotton Strawberry Lane Retro Style Tablecloth will give your table a happy look that just calls for sunshine and warm temperatures! (This is a new Red and White Kitchen design.). Let's have a party!". Can be used as a crib flat sheet. 100% cotton, lightweight, solid white color, with woven roses pattern in it. Itty Bitty Farm100% Cotton Vintage Style Tablecloth by Red and White Kitchen Co.
What a happy look it is for your table! Let's have supper!". (All of their tablecloths look great with Fiesta Ware!). Makes a great table topper and works well on a card table and patio too. (I personally use Red and White Kitchen products, and they work well for different seasons by adding your own accessories.). ((It looks great with Fiesta Ware!). Makes a great table topper and works well on a card table and patio too. Fanciful Fruit Tablecloth is 52" by 52" and 100% cotton. If I am busy, and have them dry cleaned, they do just fine that way too.). Shabby Chic Green & White Cotton Floral pattern Fabric. This 1 ply is the perfect material for your table runner, place mat, napkin craft project. Envious round tablecloth. 70” 100% Cotton. Gold and white. Brand new. Smoke and pet free home. We ship FAST!! This tablecloth is in lovely condition with no areas of fading or discoloration noted at all. Shabby Chic Green & White Cotton Floral pattern 1 Ply Fabric Napkins. What a happy look it is for your table! Let's have a party!". (All of their tablecloths look great with Fiesta Ware!). Makes a great table topper and works well on a card table and patio too. (I personally use Red and White Kitchen products, and they work well for different seasons by adding your own accessories.). Scolloped edges. Hard to find round cotton damask tablecloth. Shabby Chic Green & White Cotton Floral pattern 1 Ply Fabric Napkins. This is a 10 Piece set of 14" x 17" napkins with Rough Edges cut with pinking shears. Party Favors. 63" x 120". We are located in the Lower Hudson Valley of New York State, 30 minutes away from NYC. Murano Glass. Limoges Boxes. Table Linens. Dinner Plates. Party Favors. Leaves 100% Cotton Tablecloth-White. 63" x 120". We are located in the Lower Hudson Valley of New York State, 30 minutes away from NYC. Murano Glass. Limoges Boxes. Table Linens. Dinner Plates. NEW 30"x 30" E legant Cotton Crochet Table Runner. 100% Cotton. TREASURE WHITE LACE EDGE TABLE CLOTH LINEN BY VIOLA LINEN. Cover your table in classic style with the simple yet elegant Riegel Restaurant Series Combed Cotton Tablecloth. Available is several sizes, this tablecloth has four-sided hems for added durability. Party Favors. 63" x 144". Leaves 100% Cotton Tablecloth-White. We are located in the Lower Hudson Valley of New York State, 30 minutes away from NYC. Murano Glass. Limoges Boxes. Table Linens. Dinner Plates. 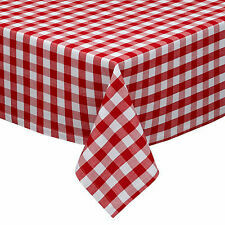 Red and White Gingham Checkered Picnic Tablecloth. Estate SIlver, Red White Cotton Gingham Check Picnic Tablecloth, 879952002987. 52" Square. IF YOU MUST HAVE A SPECIFIC CARRIER, make it known to us. Tablecloth Rectangle Off White with Fall Colors 100% Cotton Holiday 62"X104"
Scarecrow Pumpkin Flower Corn 62"X104". Fall Tablecloth Rectangle Off White with. are randomly placed to cover entire tablecloth. Older tablecloth. It was never used . It is as new. with Scarecrow, Pumpkins, Flowers Blackbirds 62 "X1 0 4" NEW. 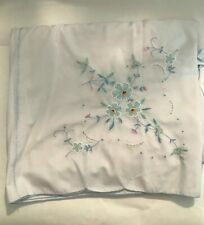 ROMANCE white tablecloth 52"x 70" temporary dining new. Shipped with USPS Priority Mail. This will help buy brighten your kitchen table. To maintain vibrant colors, wash with cold water and line dry. These were manufactured to be used in the USA. Use outside of the USA at your own risk. Brand new. Never opened. Smoke-free, cat-friendly home. 60"x104" 55% Cotton / 45% polyester. Machine Wash. Tumble Dry. Wrinkle Resistant. Seats 8 to 10. Fabulous, colorful retro rooster tablecloth! 100% cotton. Size: 52" square.